Texas-based rock band since 1994. Fake Yoga was recorded at the Echo Lab in Texas, with the help of two Centro-Matic alums, Will Johnson and Matt Pence. They seem to have brought out the Foxymorons’ raggedly glorious side, with rampant guitars slashing through hooky melody, burnt to a stub vocals weaving through delirious garage pop riffs. You might get a whiff of the rowdier end of the Elephant 6 Collective here, particularly Beulah, because like Miles Kurowsky, the Foxymorons embed world-weary ruminations in infectious lo-fi celebration. What you might miss in Fake Yoga, if you’ve been around for a while, are the mordant, Wilco-ish ballads that dotted Hesitation Eyes, “Harvard Hands,” “Lazy Librarian’s Son” and others. For that, you’ll have to hang on to the end, for the 12/8 shuffle of “Slow Geometry,” which threads a lyrical ode to low expectations through doo-woopy counterparts and guitar overload. Still Fake Yoga is a very solid album and much more compelling than 2010’s Bible Stories. If you like fuzzed-blurred r ‘n r with a large dollop of self-awareness, Fake Yoga is your jam. 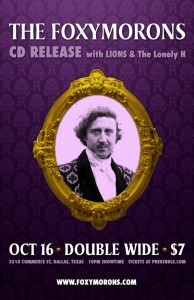 We’re playing at Double Wide in Deep Ellum, Dallas TX on Sat. Oct 16th. Show up around 10p and be sure to say hello – after all, we’re nice dudes. We’ll have CD’s, vinyl, tees and buttons on sale. Oh, and we’ll deliver some hot rock with a six-piece band of friends and co-conspirators. Later alligator! Nashville! We’re playing a show on Friday September 24th at 7:30. Or actually, this is more of a party with a ramshackle concert right in the middle. We’ll have the new album, Bible Stories, available for purchase too. Bring a friend, a snack, a drink or just arrive with dough for the album. The concert portion will begin at 9pm with a short set by The Nobility. The Foxymorons aren’t exactly local, or a band. Sure, half the duo – Jerry James – calls Mesquite home. James’ collaborator, David Dewese, lives in Nashville. And the two release albums and perform live. But they do these things only sporadically. Bible Stories is their first record in five years. Considering the music, though, it’s difficult to fault their approach. 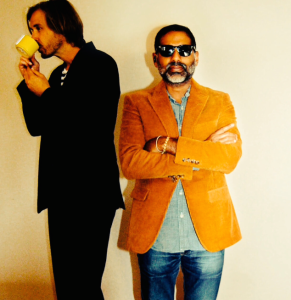 The Foxymorons have been playing together since 1994, and their hook-laden, witty power-pop reflects more than just years of experience. James and Dewese clearly have an intimate knowledge of one another’s playing styles; they sound more like old friends with a natural knack for songwriting than a formal band. It’s a playful, casual feeling that pervades Bible Stories. Both trade off vocal duties and guitar from song to song, enlisting friends to fill out their lineup with drums and piano. Yet the back-and-forth never sounds like two different voices. Big Star, Nilsson Schmilsson-era Harry Nilsson, Dinosaur Jr., Pavement – the Foxymorons coalesce every hint of their influences seamlessly, expertly referencing a broad swath of ’90s indie rock and ’70s alt-country while remaining distinctive, and adding their own flavor. 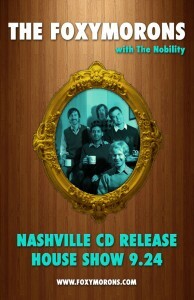 Bible Stories was recorded by the Foxymorons in a Nashville basement last winter. Perhaps the duo’s radiating confidence stems from having such firm control over the material. Most of the music is ostensibly conventional, direct pop-rock. The guys use traditional instrumentation and the melodies are immediately captivating. But like Austin’s Spoon, James and Dewese have a talent for subtlety, making music that is often deceptively simple because it’s almost too catchy at times. They can create a lot out of nothing, using perfectly timed bridges to transcend their choruses. Often, the duo interrupts a track’s progressive drive to pull back layers, focusing on a stark, ethereal harmonization, spare percussion or the striking of a lone piano key. Similarly, on the countrified Beach Boys tune, “Mesketeers,” it’s the least forceful element in the track that’s ultimately the most rewarding. Placed at the bottom of the mix, a droning organ hums purely, majestically, slyly driving the entire song. Trafficking in equally sentimental and self-deprecating reflections on youth, it’s the sort of music only aging hipsters could produce. Not that I’m complaining. There’s more swimming beneath the surface of the record than the music lets on. Bible Stories might not change your life, but it could very well – and unexpectedly – brighten your mood. Convention says bands should pick an image. In order for marketing machines to pitch your band to consumers, you need to project a look, a sound, an attitude to which fans will relate. At least, that’s what Convention says. The Foxymorons don’t care much for convention. Like their power-pop colleagues Fountains of Wayne, they’ll go anywhere the spirit leads musically, throwing identity out the proverbial window. Plus, just look at their name — would you want to market that? The Foxymorons, made up of David Dewese and Jerry James, split their time between Dallas and Nashville and have played together since the high school. Their most recent album, Bible Stories, is their first in five years and fits in perfectly with their previous releases. But, unlike Fountains of Wayne, who reference schmaltzy 1970s hits, country, traditional folk, hard rock, and other major stylistic touch-points, The Foxymorons choose to limit their winks and nods just to indie rock. Bible Stories ends up a tour de force through the past 30 years of less-than-popular pop music. Within many of these tracks are clean acoustics, Nashville-cat guitar fills, or lush vocal harmonies that might not have originally fit in with what The Foxymorons are referencing. But, it’s those bits of traditional song craft that give the band what cohesiveness it possesses, and helps Bible Stories sound new but instantly familiar. And the material is strong throughout. Just like with the aforementioned Teenage Fanclub, which features three singer/songwriters and can take the best from each songwriter for each record, Dewese and James are able to contribute their best ideas without becoming overpowered by a single voice. Those alternating voices help keep the album fresh from track-to-track as the ideas shift, and when those voices share the same tastes and vision, the results can sometimes be as magical as they are on Bible Stories. Aw man, I know, I know. Looking over these “recent” news items, I can’t help but feel a tugging sense of regret and missed opportunity. Where have we been? Where have you been? Look, let’s not dwell in the past. The important thing is that we’ve missed each other…and if it’s any consolation, the scrappy underdogs from Mesquite, Texas have recorded a brand new LP. Finally! We recorded just like the old days, cheaply, haphazardly, and with lots of love. Our pal Brian Fuzzell once again manned the drumkit. We shared stories, froze in the basement, drank enthusiastically, ate at the meat-and-three next door, zip-lined at our friend Sally’s house and fashioned makeshift sleds for winter hi-jinks. And here’s the thing: A new record. TItled BIble Stories. Out August 24, 2010. The Foxymorons are childhood pals, Jerry James and David Dewese. They formed in Mesquite, Texas in 1994. 5th album, 'Fake Yoga' out now!